Introducing, Brian Tracy's "The Power of Clarity"
If you've always thought that working harder and longer will bring you the life you want and deserve, you're wrong... it's time to learn the RIGHT way to work, so you achieve more than ever - in less time! If you're reading this page, then I know you're ready to take the steps necessary for success. I know you're willing to work hard, to make some changes, and to finally experience the results you know you deserve. If you're like so many of my students who come to me looking for a better way to achieve the success they want to, then you've been working as hard as you can for as long as you can remember. You've gone to classes, read books, and stayed up to date on how to be among the top professionals in your field. You've constantly worked on perfecting your skills, whether you're in sales or business, or something else entirely. And you're exhausted. Despite all your hard work, you're still struggling. You watch as other people - your colleagues who you know aren't much smarter and definitely don't work harder than you - experience awesome results, while you work harder than ever for mediocre results. Why do you continue to spin your wheels while others gain momentum and move quickly forward? Fortunately, I have the answer: you need to simplify. When you have absolute clarity about what you want, and how you're going to get it, you're able to focus on what's important, so you get more done in less time. 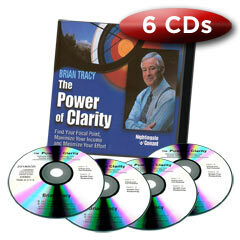 I show you exactly how to do that in my new program, "The Power of Clarity". "This series of audios and the workbook has transformed my life. For the past 3 years, I have doubled my time off and have doubled my income while improving my relationship with my wife and kids and strengthening my faith life as well." How to enjoy more quality time with your family-create your "Mission Statement"
You learn absolutely everything you need to know to take the shortest, fastest route possible to your destination: ultimate success. Ready to get in on it? And of course, this product is covered by my Iron-Clad Satisfaction Guarantee! Take your time to enjoy your products and put the proven strategies to work for you in your life and business. If for any reason or no reason at all you are not completely satisfied with your product, just return it within 365 days and you'll receive a full 100% product refund. That's a full year to put us to the test, use the information, put it to work, and make your dreams come true-all the risk is on us! Now are you ready to order? "If You Can Only Afford 1 Program then you should purchase this program. I personally feel that if you applied what Mr. Tracy talks about in "The Power of Clarity" you can easily take 10 years off your success learning curve, which to me is easily worth a month's salary!" Achieving ultimate success doesn't have to feel like a struggle. Discover the REAL secret to FINALLY accelerating your results. Order "The Power of Clarity" now! This program is fulfilled with elemental truth. The only thing you should do is follow these simple and obvious steps and nothing can stop you from being one of the most successful, well-balanced and happy person. Clear to hit your target. Very good. Amazing. Clear mind is clear of all obstacles. This is actionable mind blowing product, I wish I had this products long time ago! I've listened to Brian Tracy materials and read his books for a few years now. When I first started, the concept of "doubling" my income seemed fanciful - yeah, it'd be nice but I didn't think it really possible. Over the past five years I have more than tripled my income, in the same position in the same field with the same company - and I actively plan to continue to increase my income year over year. Does it work? Without a doubt. Is it possible? Absolutely. It's not really a question of, does this or any other program that Brian offer work, or can it work for you. The real question is how soon are you going to get started and get serious about your future. If you're familiar with other Tracy materials, there will be some overlap. I'd be concerned if each offering from Brian Tracy did not overlap and mesh with everything else he offers. Hearing the same thing a little different, or at a different point in time in your life, or as used in a different example can be exactly what you need to hear at that moment and be the catalyst to accelerate your achievement and success beyond what you've accomplished already. I highly recommend anything that Brian offers. He has taken the entire history of success and achievement and given us the distilled version. Get it, use it, apply it, and you will get results!